I like to use apple cider vinegar a lot in salad dressings, because it has so many health benefits. Here is a super speedy but flavorful side salad you can whip up to go with things like roast chicken or burgers. Whisk together olive oil, vinegar, mustard, salt, and pepper. 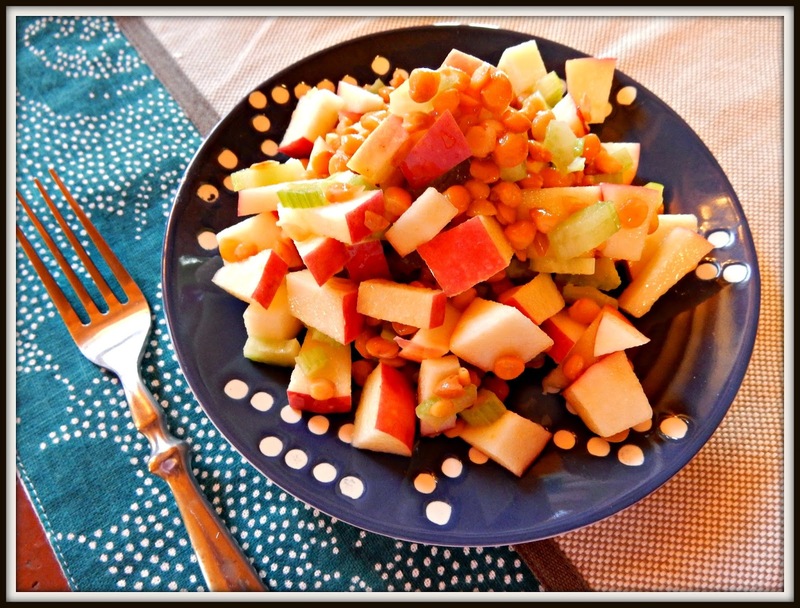 Toss with lentils, apples, and celery. Serve immediately. This recipe was from a Woman's Day magazine a few months ago, and I modified it just slightly. Readers, have you tried any new recipes lately? Oh, this sounds good--and Tina-friendly! LOL I love lentils and the mix of flavors here sounds good. Thanks for sharing this! That looks fantastic....I never would have thought to mix apples, lentils and celery! This sounds like a nice summer salad to have ready. I'm going to try it at some point. Healthy and delicious is always a win, win! I never thought to pair up the to. It looks really good! Sounds so delicious and healthy! But it's not easy to find lentil and apple cider vinegar. Hope I can substitute with others.